"Acoustic guitar" refers to hollow-bodied guitars without electric amplification. They may have nylon or steel strings. The strings of a six-string guitar are tuned to E, A, D, G, B, E, a fourth apart except for the major third interval between B and G. Frets are placed by the fret rule "one-eighteenth the remaining length of the string". This makes them a semitone apart. Top plate made of spruce or cedar. Spruce more prevalent in steel string "folk" acoustics while cedars are more prevalent in classical guitars. (Williams, Jim, A Guitar Makers Manual). Since these woods are light but with a tight grain, they enhance the capacity of the top plate to vibrate and serve as a sound source that is much more efficient than the strings themselves. The vibrating strings couple energy into this top plate. Brazilian rosewood is favored for making the backs and sides of a guitar because it is very hard and tends to contribute to a brighter sound. A round hole 3 1/4" to 3 1/2" in diameter in the top plate creates a cavity resonance which strengthens the sound produced. The strings of a guitar allow control of the pitch and harmonic content of the sound produced. The pitch is determined by the length, mass and tension of the strings. The produced frequencies are resonant frequencies of the strings, which depend inversely on the length (eg., cutting the length in half by depressing the string to the 12th fret will double the frequency to the note one octave up from the fundamental frequency of the string.) The mass and tension together determine the speed of the wave in the string. Since it is desirable to have about the same tension in each of the strings to keep from putting any distorting torque on the instrument, a matched set of strings will have carefully adjusted masses so that the strings are tuned to the correct intervals when the tensions are the same. According to Sloane, the string tensions for steel strings are on the order of 160 to 200 lbs. The "gut" strings (actually usually made of nylon) of classical guitars have somewhat lower tensions on the order of 120 lbs (Hunter). The bridge transfers the vibrational energy of the strings to the top plate of the instrument - the strings alone can't effectively move air to produce sound, but the vibrating top plate can do that quite efficiently. The air cavity resonance produced by the round hole can be demonstrated by singing a note somewhere between F#2(87 Hz) and A2(110 Hz) (depending on the guitar) while holding your ear close to the sound hole. You will hear the air in the body resonating. Another way to hear the effect of this resonance is to play the open A string while slipping a piece of paper or cardboard back and forth across the soundhole. Because this stops the resonance or shifts it to a lower frequency, you will notice the loss of bass response when you close the hole. The coupled resonance of the front and back plates produces a resonance about an octave above the main air resonance. The Spaniard Antonio de Torres Jurado is credited with considerable enhancements of the modern classical guitar in the mid nineteen hundreds. The body and the sound hole were enlarged and the fretboard widened. Perhaps his most important contribution was the development of "fan strutting", a series of struts which diverge from the sound hole on the top plate of the instrument. This design gave it a considerably stronger, more sustained tone. To provide for definite pitch relations between notes, metal inserts called frets are inset in a fretboard on the neck of guitars. The raised edges of the frets provide fixed lengths of string when the string is held down against them with a finger. The interval between successive frets is normally one equal tempered semitone. There are typically 19 frets on classical guitars, which with reference to the equal tempered octave can be seen to be and octave and a fifth. Electric guitars may have up to 23 frets. Frets on guitars are placed by the fret rule "one-eighteenth the remaining length of the string". This makes them approximately a semitone apart. If the musical interval produced by this rule is expressed in cents, then a string of length 17/18 of its original length will be higher by an interval of 98.9 cents compared to a precise semitone of 100 cents. 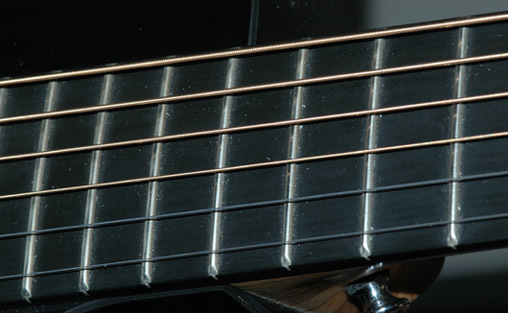 Since the just noticeable difference in pitch is about 5 cents, then the fret rule could be applied for one change of fret with no problems in intonation. One would have to be careful about cumulative errors if the rule were applied repeatedly, so it should be checked at intervals such as the musical fourth which should be precisely 3/4 of the length of the open string. The above example is an extreme case, but it is designed to show that there are some intonation problems with guitars which arise from the fact that the frets are tuned to equal tempered intervals while the harmonics of the strings are almost exact integer multiples which correspond with just intonation. In this example, consider that the low E2 string has been plucked, sounding the E2 at 82.4 Hz, but also producing all harmonics of that pitch. This will include a small amount of the 7th harmonic, which from the list of harmonics expressed in cents you can see to be the most out-of-tune with equal temperament. That 7th harmonic will be a D5, but as you can see from the equal tempered frequency list, it is 11.4 Hz flatter than the equal tempered D5. The equal tempered D5 can be produced with the 10th fret of the high E4 string, but if you sounded those two strings together using the 10th fret of the E4 and the open E2 string, they would be 31 cents out of tune. Compared to the just noticeable difference in pitch of 5 cents, this is seriously out-of-tune. A far fetched example, no doubt, but it shows that the use of equal temperament along with acoustic systems that produce exact harmonics can produce some intonation problems. Tune string 5 (A2) to 110 Hz using an electronic metronome or tuning fork, etc. Tune string 6 (E2) by depressing it at fret 5 (A2) and matching this pitch to the pitch of open string 6 (A2). Tune string 4 (D3) by depressing string 5 at fret 5 (D3) and matching these pitches. Tune string 3 (G3) by depressing string 4 at fret 5 (G3) and matching these pitches. Tune string 2 (B3) by depressing string 3 at fret 4 (B3) and matching these pitches. Tune string 1 (E4) by depressing string 2 at fret 5 (E4) and matching these pitches. If you are a fortunate person, your guitar now might be in tune. If the frets of the guitar are set for equal temperament ), then the 5th fret is 5 semitones or an equal tempered musical fourth. That frequency should equal the open string frequency of the next string up in pitch. They can be matched by "zero beating", adjusting the string so that no beat is heard. After tuning for the zero beat, you should be able to pluck the lower string (held at the fifth fret) and the higher string should start to vibrate, driven by the vibrations in the bridge. The uncertain ending in step 7 above is caused by a number of "real world" complications. One of the complications is that the upper harmonics of the lower strings will not necessarily sound in tune with the upper strings, even when their fundamentals are tuned to the prescribed interval. One of the reasons is that perfect harmonics from the strings produce intonation problems with equal temperament. If you examine the intervals in cents for a harmonic sequence, you find that the upper harmonics are out of tune with equal temperamment, with the 7th harmonic being notably bad. So one kind of problem arises if the harmonics are perfect, but another arises if they depart too far from perfect harmonics. Because of the stiffness of the bass strings, their upper resonances tend to be sharp compared to exact whole number multiples (harmonics). The upper harmonics of the lower strings may beat with the upper strings in such a way to produce an unpleasant sound. This sometimes leads to a process which is called "octave stretching" in piano tuning. The upper notes of the instruments are tuned a little sharp to sound better when played with the lower strings. The measurements and calculations involved to optimize the tuning are unreasonable for a simple tuning process, so in practice you follow a basic procedure like that described above, and then adjust the tuning by ear to get the most pleasing blend. After going through the procedure above for relative tuning of the strings, it should be mentioned that inexpensive digital tuning devices are readily available which allow you to tune each string individually. Some give an LED indicator when you are in tune and a readout of how many cents sharp or flat you are with respect to the standard pitch. Even after tuning to one of these devices, you might yet have to deal with the difficulties described above in getting the most pleasant sound out of the instrument. But once you found a mixture that you like, you could use the digital tuner to note how many cents sharp or flat you tuned each string to get that optimum sound.